Created by our eLearning application development team, Dr. Moku's Hiragana & Katakana is a language learning app targeted at users interested in learning the two prominent syllabaries, as reflected in the name of the app itself, of the Japanese language. Rated as one of the best language learning apps, it gives a lucid animated walkthrough to the Japanese writing system. The language course is available in two modes: Manual (allows you to learn at your own speed) and Autoplay (Each symbol and audio clip play in sequence), followed by an interactive quiz session. Dr. Moku is a trusted brand that makes learning a fun leveraging iOS and Android app development services. It reaches out to its users, irrespective of demographics with educational apps and learning systems based on mnemonic devices and unconventional methodologies. It has extended its portfolio from Japanese to include more languages like Arabic, Spanish and with plans for Kanji, Hangul Chinese, and Gurmukhi. What Dr. Moku Was Exactly Looking For? Dr. Moku’s key concern was to keep Android users engaged with the language as it’s considered as one of the most difficult languages in the world to read, speak and write, particularly for a person of foreign origin. So, it was in the quest of a language learning apps development company that can help with its design-led engineering. Here are top reasons that put Root Info Solutions, ahead of other eLearning app development companies. The idea behind was to make learning Japanese a fun. The selection of Root Info Solutions was based on the demonstrated skills of its Android app development team over the last decade. Clients have rated the mobile app development services rendered by Root Info Solutions as 5 out of 5 on App Futura, a leading business portal. Root Info Solutions implements the best DevOps practices and tools. Keeping its stakeholders from clients to software developers and UI-UX designers and testers connected and informed, the mobile app development company makes sure that projects get delivered without fail on or before the stipulated time. Making non-native people of particular demography grasp the fundamental of a foreign language and acquire skills in terms of understanding, writing and speaking is an interesting but a difficult task. And it becomes more difficult when both the educator and learner are sitting geographically apart. The Internet and mobile apps have facilitated a good medium but the challenges remain to make the education and learning methods intuitive and engaging. Moreover, the people’s inclination towards a foreign language starts after childhood, driven by causes like foreign trips for reasons including, but not limited to, vacation, education, job opportunities and business contracts. And it’s well understood that such consumers have little time to invest in learning. Hence, our responsibilities as an educational or elearning app developer was to keep in mind the perception of this impatient cohort and create an amazing mobile learning platform that makes language learning a fun. The demand of the hour was to meticulously use the UI-UX design principles offered by Google, and complement it well with the mobile app programming while creating the various reading, writing and speaking curriculum based on pictorial and video mnemonics. 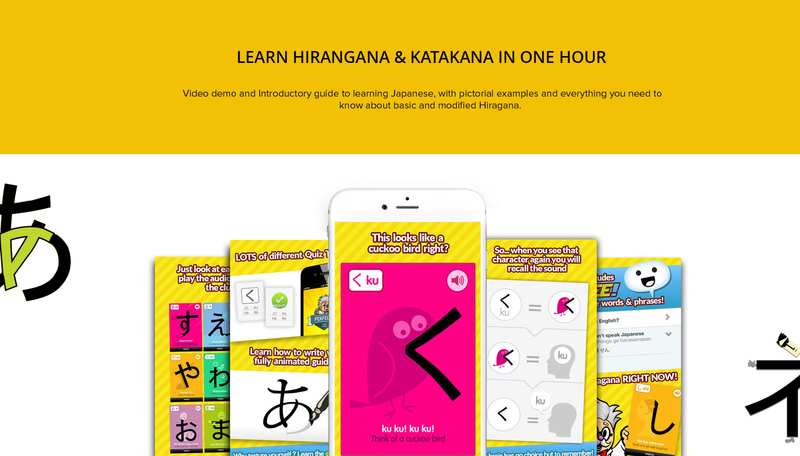 The free app makes users acquainted with basic words and phrases of Hiragana and Katakana, while the paid version available through in-app purchase enables them to take advanced level of learning through audio charts, quiz and practice modes. Keeping the vision and mission of Dr. Moku at the helm, we completed the development, testing, integration and deployment of the mobile application. This app secured a record 250, 000 subscriber-base across Android and iOS platforms. And, it's a matter of great pride for our Android app development team that their creation has contributed significantly to the number. Google Play reveals that the app has been downloaded as many as 100,000 times by users.